LEN - www.lankaenews.com | TRC has profusely lied ! LeN was blocked on presidential media director’s letter – RTI Commission reveals !! TRC has profusely lied ! 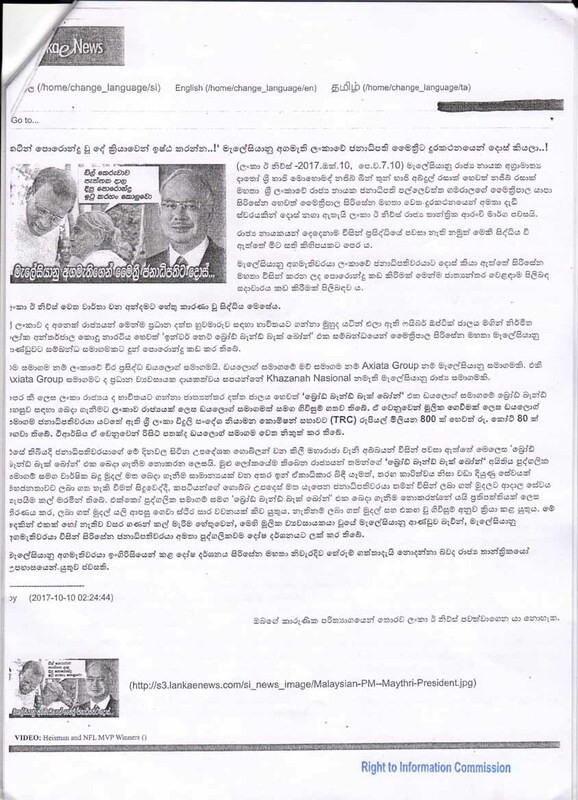 LeN was blocked on presidential media director’s letter – RTI Commission reveals !! 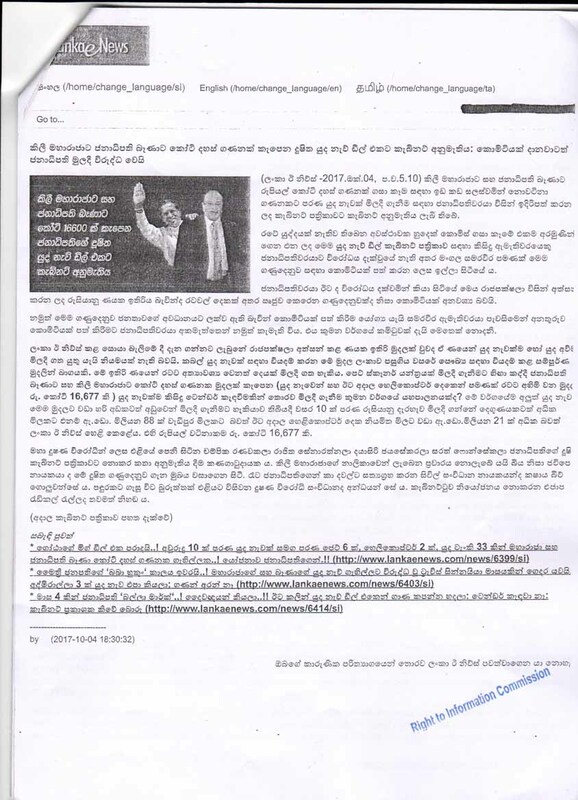 (Lanka-e-News - 16.April.2018, 9.40PM) It has come to light that Lanka e news was illegally blocked on a letter issued by the director , presidential media based on the investigations conducted by the RTI (Right to Information) Commission into an appeal made to it. 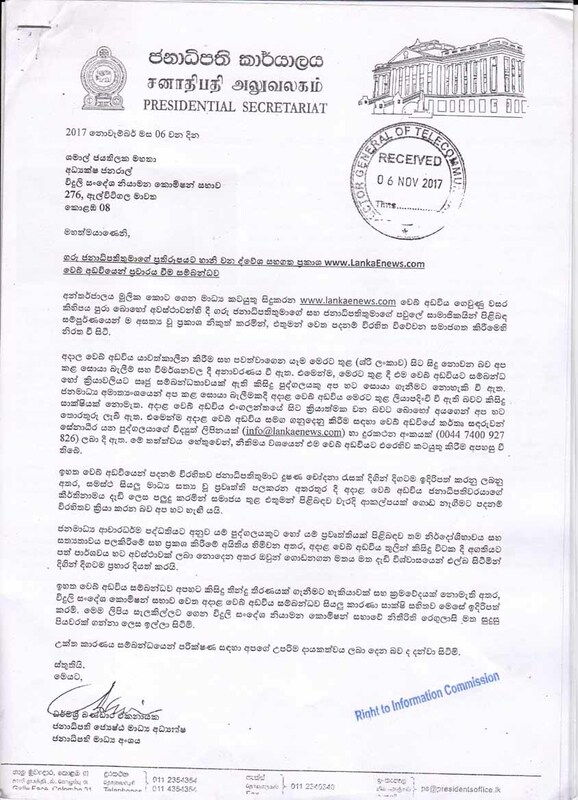 Ms. Raisa Wickremetunge of Ground views made an appeal to RTI Commission for refusing to provide information citing national security as a reason when inquiries were made from TRC (Telecom Regulatory Commision) as to why Lanka e news was proscribed. Following an investigation , the RTI Commission which inquired into it had given a verdict that the presidential media director had blocked the website on spurious grounds , and the decision taken by the TRC to refuse giving information shall be reversed. 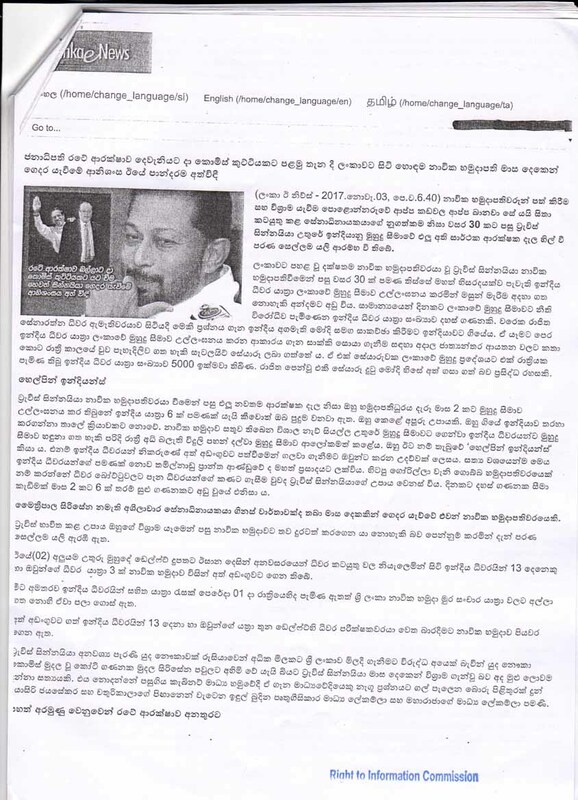 The letter sent to TRC by Dharmasiri Bandara Ekanayake , the director presidential media ,and the news report of Lanka e news regarding the president which is the subject of accusation are in the image . 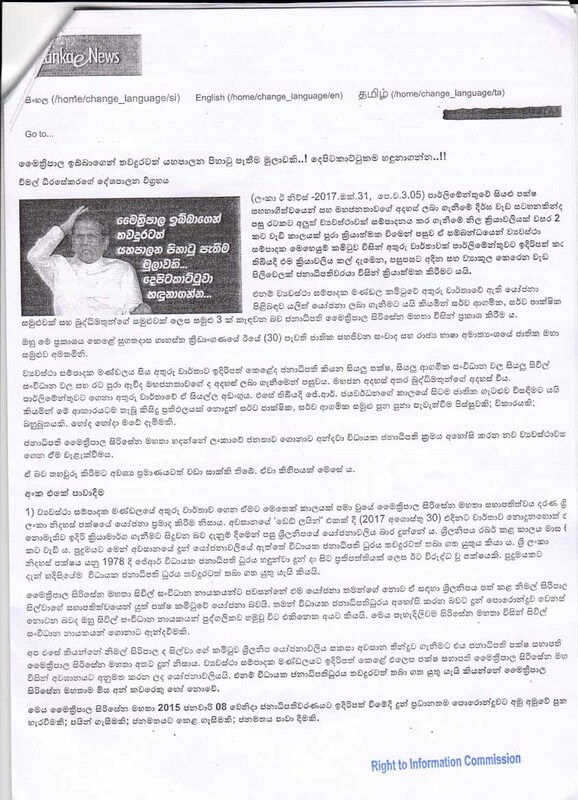 The presidential media director by his letter and the TRC director general, before the Right to Information Commission (RTI)had said they tried to contact Lanka e news regarding the LeN report but without avail. That is an absolute lie. A lie that deserves sentence to the gallows. The e mail , telephone and skype of Lanka e news are active all 24 hours of the day, and no one had responded in connection with that report. If they had we challenge these liars who thrive on mendacity using their official labels and ranks for their own selfish survival to adduce proof in support of their statement . In the least , no one has even responded or commented via the LeN face book page. 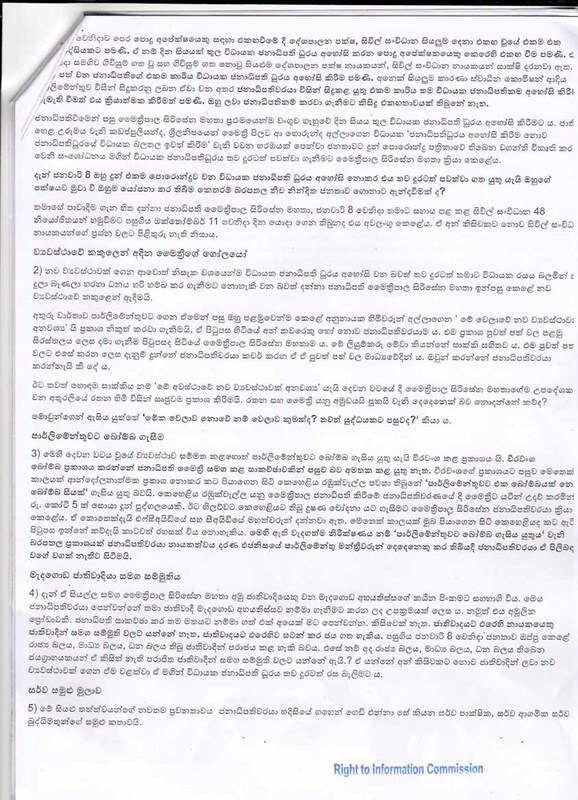 Lanka e news which warmly welcomes right to answer , if we had really received a response , certainly we have no reason to refrain from publishing that. 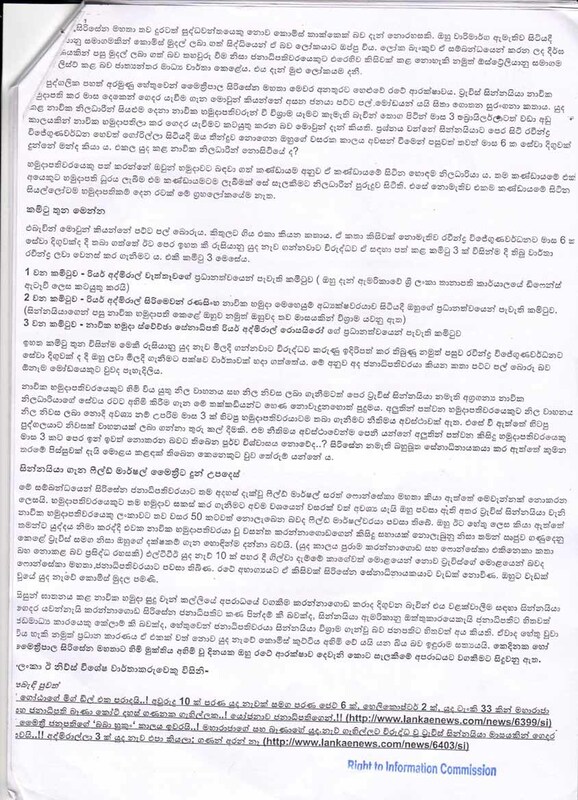 In any event Lanka e news will soon give a reply to the presidential media director’s letter no matter how stupid ,which was addressed to the Director General of TRC . A report pertaining to the RTI investigation and decision is hereunder. The Appellant by information request dated 10.11.2017 has requested the following information. The Information Officer (IO) had responded on 28.11.2017 stating that the PA has decided to provide the documents relating to web addresses blocked by the PA, and, that information requested under item 01 of the information request was not in the possession, control or custody of the PA. The IO had further stated that the information requested under items 3,4 and 5 would be withheld as disclosure of such information would undermine the defence of the State or national security and amounted to exempted information covered by Section 5(1)(b)(i) of the RTI Act. The Appellant being unsatisfied with this response, then appealed to the Designated Officer (DO) on 07.12.2017, The DO responded on 15.12.2017, stating that with regard to item 1 of the information request the PA had informed the Fixed and Mobile Operators to block news website based on the instructions communicated to it by the Ministry of Mass Media and as such, it did not have any records of complaints against websites in its possession or custody. With regard to item 2, the information had been provided to the Appellant. The decision of the IO with regard to item 3 was reiterated. The Appellant preferred an Appeal to the Commission on 29.12.2017. The IO of the PA stated that the PA entertained only telecom related complaints and not complaints against Websites. She submitted that complaints in respect of websites are lodged with the Ministry of Mass Media as websites are registered with that Ministry. The IO was reminded by the Commission of the duty on Public Authorities under Regulation 4 clause 6 of the Right to Information Regulations of 2017 published in Gazette No 2004/66 dated 03.02.2017, to transfer the said request to the relevant PA where the IO is aware that the information is held by such PA. The IO then stated that she had in other instances transferred such requests but had refrained from doing so in this instance as the said request as it did not contain a general question but a specific question related to the TRCSL. The Appellant stated that according to her own understanding the TRCSL was the relevant PA to file the information request with. The IO further stated that the Director General of TRCSL had requested for a further date to make his submissions on this matter. The duty to transfer as provided for in Regulation 4 clause 6 of the Right to Information Regulations of 2017 published in Gazette No 2004/66 dated 03.02.2017 has been stipulated for the exact purpose of preventing an Appellant from going from pillar to post in the search for information. All PAs are required to abide by this duty rather than attempt to circumvent the same. The PA is directed to inquire from the Ministry of Mass Media as to what information is in its custody, possession, or control relating to the information request of the Appellant and apprise us of the same. The information requested in this instance is legitimate information that can be obtained through a right to information request unless the PA can prove that any or one of the exemptions provided for in the RTI Act, No. 12 of 2016 would apply and further establish that it is not in the public interest to provide the information. The PA is therefore directed to file written submissions before March 12, 2018 detailing its specific justification of the exemption cited by it in denying the information in respect particularly of the plea invoking Section 5 (1) (b) (i) (ie; that the information would undermine the defence of the State or its territorial integrity or national security). The Appellant may, if she wishes, file counter written submissions by March 19, 2018. The Public Authority is directed to weigh the public interest with regard to the exemption cited in its written submissions. Next date of hearing: 23/03/2018. The IO stated that in pursuance of the direction by the Commission at the last hearing of the appeal, she had sent a letter to the Ministry of Mass Media inquiring as to what information is in its custody, possession, or control relating to the information request of the Appellant. She further submitted that the Director – General of TRCSL (DG)/DO had brought along the documents relating to items 3 and 4 of the information request made by the Appellant. She stated that the PA would rely on the Commission’s decision whether to release the information. The IO further stated that information relating to item 2 of the request had already been provided to the Appellant. The DG of the PA stated that items 3 and 4 were in relation to news items about the President and his family. He stated that there had been a written complaint made to TRCSL by the Office of the President regarding unsubstantiated stories appearing in the form of news items in the Lanka-E-News website. 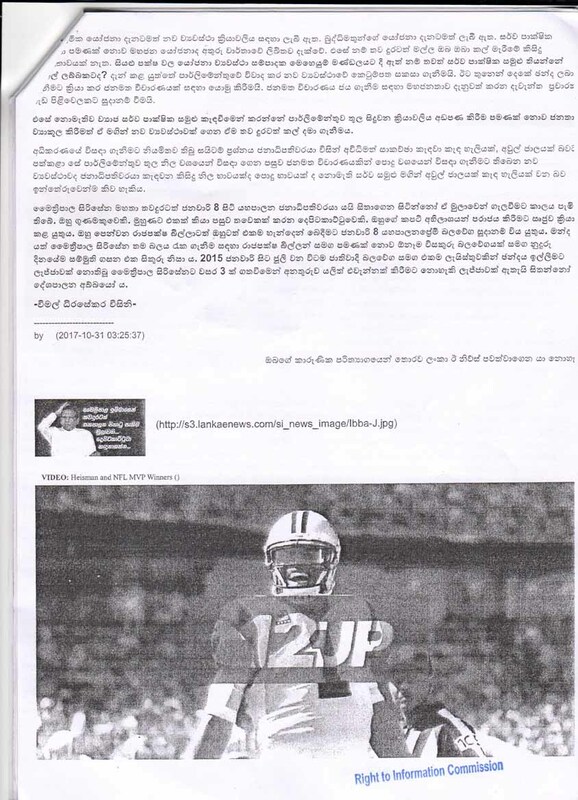 Copies of those news items had also been attached to the said complaint. The DG further stated that the documents in his possession that he presented for the perusal of the Commission were the only documents the PA had in regard to this information request and that they do not have any more records. Having perused the complaint made by the Office of the President and the attached news items, we see no reason for the information to be denied to the Appellant. The veracity of the news items in question are not for this Commission to decide. The complaint submitted by the President’s Office on November 6th, 2017, only brings these news items to the notice of the PA and requests that suitable action be taken according to law. This is legitimate information that may be disclosed by the PA. The PA is directed to provide a copy of the complaint and attached news items to Appellant. The Commission is of opinion that these documents fulfil items 3, 4 and 5 of the information request made by the Appellant. The PA is directed to liaise with the Appellant with regard to providing the information requested in item 1 once it receives a response from the Ministry of Mass Media. The decision of the DO is reversed. The Appeal is concluded.